Saint Rapahel was born in 1835 as Joseph, son of Andrew and Josepha Kalinowski in present day Lithuania. Saint Raphael felt a call to the priesthood early in his life, but decided to complete his education. He studied zoology, chemistry, agriculture, and apiculture at the Institute of Agronomy in Hory Horki, Russia, and at the Academy of Military Engineering in Saint Petersburg, Russia. Saint Raphael became a Lieutenant in the Russian Military Engineering Corps in 1857. During his post he was responsible for the planning and supervised construction of the railway between Kursk and Odessa. He was promoted to captain in 1862 and stationed in Brest-Litovsk. In Bret-Litovsk he started, taught, and covered all the costs of a Sunday school, accepting anyone interested. In 1863 he supported the Polish insurrection. He resigned from the Russian army and became the rebellion's minister of war for the Vilna region. He only took the commission with the understanding that he would never hand out a death sentence nor execute a prisoner. He was soon arrested by Russian authorities, and in June of 1864 he was condemned to death for his part in the revolt. Fearing they would be creating a political martyr, they commuted his sentence to ten years of forced labour in the Siberian salt mines. Part of his sentence was spent in Irkutsk, where his relics have been moved to sanctify the new cathedral. Upon his release in 1873, he was exiled from his home region in Lithuania. He moved to Paris, France, and worked there as a tutor for three years. In 1877 he finally answered the long-heard call to the religious life, and joined the Carmelite Order at Graz, Austria, taking the name Raphael. He studied theology in Hungary and then joined the Carmelite house in Czama, Poland. He was ordained on January 15, 1882. 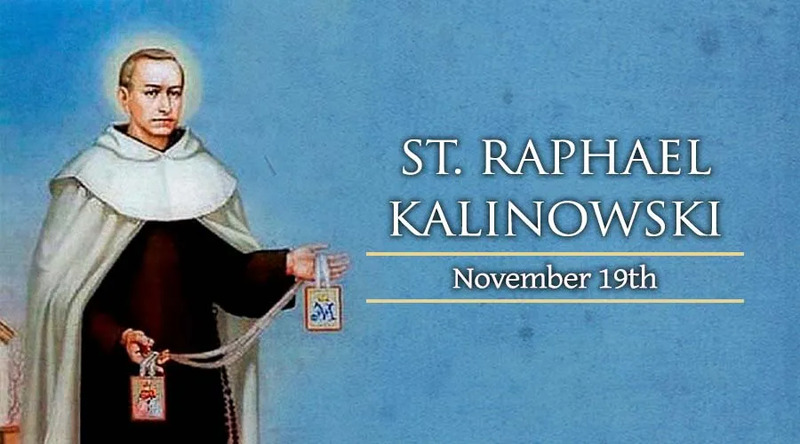 Saint Raphael worked to restore the Discalced Carmelites to Poland, and for church unity. He founded a convent at Wadowice, Poland in 1889, and worked alongside Blessed Alphonsus Mary Marurek. He was a noted spiritural director for both Catholics and Orthodox. He was considered an enthusiastic parish priest and spent countless hours with his parishioners in the confessional. Saint Raphael died in 1907 and was cannonized by Pope John Paul II in 1991.